Green is the latest buzzword and accommodations nationwide are rushing to cash in. That has resulted in “green washing,’’ or creating the illusion of environmental virtue without the substance. 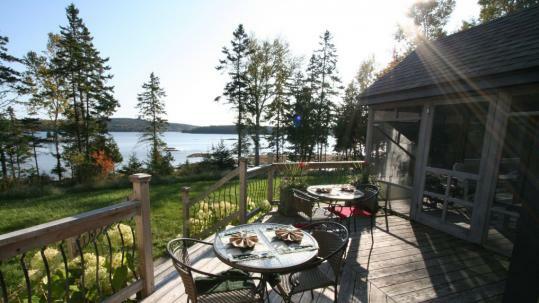 Check into one of these Maine properties to sample the real thing. Maple Hill Farm B&B Inn and Conference Center, Hallowell This renovated 1906 farmhouse, set on 130 acres laced with trails and next to an 800-acre wildlife preserve, was green long before it became a household word. The inn, Maine’s first certified Environmental Leader green lodging, produces its own energy using 202 evacuated tube collectors, 126 photovoltaic panels, and a wind turbine. It has a combined solar hot water and electric system that generates enough power to reduce CO2 emission by more than 40,000 pounds annually. “Some days we get all of our power from solar and wind, but typically, it’s about 50 percent overall. We do get most of our domestic hot water from solar,’’ Cowger says. Cowger sees a more enlightened consumer these days, one who inquires about green policies. “Hanging up and reusing a towel is no longer enough,’’ he says. 800-622-2708; www.maplebb.com; rates $100-$205, including breakfast. The beachfront inn, which says it is the first in Maine to heat with biofuel and the first in New England to have dual-flush toilets, also has solar panels, and when it added a spa last year during a multimillion-dollar renovation, the green initiatives continued. During treatments, “guests are wrapped in bamboo towels, and we use natural products,’’ Kew says. Five acres are dedicated to a wildlife habitat, including a certified butterfly way station. “We created fun and whimsical programs for kids and adults, such as how to plant for wildlife for adults, and bug’s-life summer programs for kids, in which they dress like bugs and learn about ecosystems from a bug’s viewpoint.’’ 800-888-4287; www.innbythesea.com; $189-$819. Now he’s constructing a solar energy system. And he has turned his green efforts into a neighborhood project. He collects plastic grocery bags from neighbors to use as trash-bin liners in guest rooms. “We’ve also built a recycling station in our parking lot for glass, plastic, and aluminum for all our neighbors. We give the glass bottles to the school for its fund-raising.’’ 207-359-8080; www.dragonflyeinn.com; $145-$175, including organic continental breakfast and use of bicycles. Oceanside Meadows, Prospect Harbor The property, which comprises two 19th-century farmhouses operating as bed-and-breakfasts on 200 mostly undeveloped acres on the Schoodic Peninsula, stretches from a saltwater marsh, through forests and meadows, by a brackish pond, to a rare sand beach framed by grassy dunes and craggy ledges. It’s a spectacular piece of real estate that owners Ben Walter and Sonja Sundaram aim to preserve. The inn’s renovated, 125-seat barn is home to The Innstitute for Arts and Sciences. Programs have included lectures by astronomer Alan Hale (co-discoverer of the comet Hale-Bopp) and ornithologist David Wingate, astronomy programs, and concerts ranging from Opera Maine to Paul Sullivan. Sundaram maintains organic gardens, which she forages each morning for herbs and edible flowers to use in elaborate breakfasts hearty enough to fuel guests for a day of environmental explorations. 207-963-5557; www.oceaninn.com; $119-$209, including full breakfast. Three Pines Bed & Breakfast, Hancock This oceanfront organic farm and bed-and-breakfast is completely off the power grid. The 40-acre property on the east side of Hancock Point fronts on Sullivan Harbor, just below the Reversing Falls. Owners Ed and Karen Curtis have completed a conservation easement through the Frenchman Bay Conservancy to protect it from development. “My husband had taken an interest in solar in the late 1970s, and when we were ready to make a change from our engineer lives, he wanted to put that interest into practice,’’ Karen says. Ed did all the planning to make the house as energy efficient as possible. The design is passive solar; photovoltaics provide electricity; appliances are primarily propane-powered; satellite technology operates the TV and Internet systems; a masonry heater provides warmth in winter. For the Curtises, it’s not just about being green, but also about sustainable living. They raise rare breed sheep for wool and chickens for eggs; grow organic vegetables, berries, and grapes; maintain a 40-tree orchard; and recently began keeping bees. They also make cheese, yogurt, soap, cider, jams and jellies, and maple syrup. “We get people drawn to various aspects of our project here,’’ Karen says. “Some have no idea we’re off the grid, they’re coming strictly for location. Some are very interested in the farming aspects. Some come because we’re vegetarians. Some people never even know we’re off the grid, if the subject doesn’t come up. Unless they happen to ask, it’s completely transparent.’’ 207-460-7595; www.threepinesbandb.com; $85-$125, including full vegetarian breakfast. Maine Huts and Trails, Carrabassett Valley This system is the ultimate in green. Getting to the full-service, bordering-on-hiker-luxury huts, requires hiking or mountain biking in summer, cross-country skiing or snowshoeing in winter. Two huts, one at Poplar Stream Falls and the other on the shores of Flagstaff Lake, have been completed. Fund-raising is underway for the third, which will be sited on the north shore of the Dead River, about a mile below Grand Falls. Although off the power grid, they have electricity and heat, and the restrooms have hot showers, motion-sensor-operated lighting, and composting toilets. Power is produced by means of hydro, a wood boiler, solar panels, and a woodstove. It’s a sophisticated system backed up by a propane generator. At times during the year, the Poplar Falls hut actually produces as much as 55 percent more power than it can use, says Alex Frankel, a seasonal worker. “We have to dump it, because there’s no way of storing it.’’ 207-265-2400; www.mainehuts.org; $65-$93 adult, $32-$50 children ages 3-12, for shared accommodations; private dorms sleeping two to four are available; rates include bunk with mattress and pillow, breakfast and dinner. Hilary Nangle can be reached at hilary@hilarynangle.com.